The rebooted DuckTales has a clear reverence for the original, and there are things for fans to notice and geek out over in much of the footage we’ve already seen. And yet, there are still some Easter eggs out there waiting to be found. At San Diego Comic-Con, io9 caught up with executive producer Matt Youngberg and co-producer and story editor Francisco Angones to talk about the new series. “There’s so much even in what we’ve released already. There are so many Easter eggs and even some that people haven’t picked up on yet,” said Youngberg. “Yes, just throw overhand Easter eggs at people out of a car door,” said Angones. In reality, even though there are a lot, they serve a story purpose. “But even as the show goes on, there’s so much love we have for the original series and the original comic books that inspired the original series, that we’re trying to put as much of that into the show as we can,” Youngberg said. “But not in a just ‘wink and a nod’ kind of way, there’s very character based reasons for all of it. 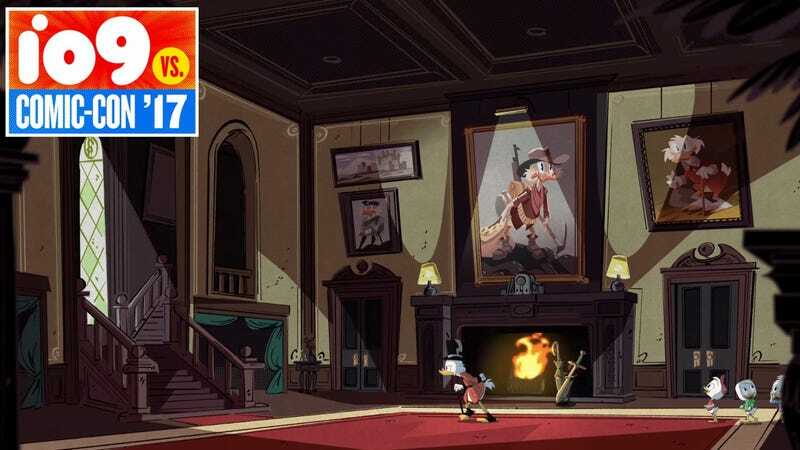 It’s the paintings behind Scrooge in certain sequences, where it looks like you’re just kind of creating a bunch of Easter eggs, but really those are the kinds of pictures we thought about for who he is as a character, what would he have on the walls, and we want what represents him as a character to be present on the walls,” he finished. You can see the rest of our interview with Youngberg and Angones below. And DuckTales premieres on Disney XD tomorrow.